This portal is part of Powerbase—your guide to networks of power, lobbying and deceptive PR. Powerbase has a policy of strict referencing and is overseen by a managing editor. Who's behind the push for fracking in the UK? Our Fracking portal tracks the companies, people and lobbyists behind the all-out push for shale gas exploration in the UK and beyond. It sheds light on who is influencing the debate over fracking and the tactics used to persuade the public and our politicians. Powerbase is run on a tiny budget, and many contributors kindly give their time for free. If you can help out we'd love to hear from you. Or if you find these resources useful, please consider a donation toward our modest overheads. Thank you. 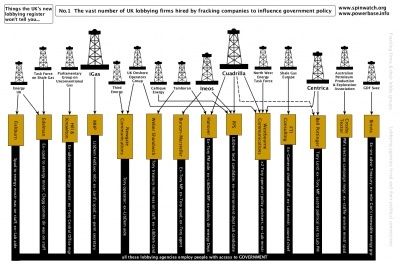 Who are the fracking lobbyists? CLICK FOR OUR COMPLETE LIST OF FRACKING PROFILES. Andy Rowell, The curious case of the guard dog, anti-fracking protesters and North Yorkshire police, Spinwatch, 13 June 2018 and also shorter version in Opendemocracy. To learn how you can edit any article right now, visit Powerbase:About, Welcome, newcomers, our Help page, Frequently Asked Questions, A quick guide to editing or experiment in the sandbox. Or contribute a new article: go to Quick Guide to Getting Started. Powerbase can be made more effective if more people join the project. If you have research or writing skills or just spare time, you can help. If you are unsure where to start, you could expand some of the recently created stubs. (If you look at the recent changes page you will see these 'stubs' - articles that may just be a line or two and needing to be fleshed out). There is an automatically updated page which includes the pages signalled by Powerbase users as most wanted. There's also a page with a list of Things you can do to help. Powerbase is a collaborative venture initiated by Spinwatch in collaboration with Lobbywatch, GM Watch Red Star Research and Corporate Watch, but put into effect by a wide variety of volunteers and independent researchers. Contributors are now working on 18,480 articles. Disclaimer: Powerbase is an encyclopedia of people, issues and groups shaping the public agenda. It is a project of the Spinwatch—email editor AT Powerbase.info. Antispam note: To avoid attracting spam email robots, email addresses on Powerbase are written with AT in place of the usual symbol, and we have removed "mail to" links. Replace AT with the correct symbol to get a valid address. We regret the inconvenience this entails. Campaign for more effective antispam regulations. This page was last modified on 4 April 2019, at 03:11.